Mike with legendary coach and nike shoe inventor, Bill Bowerman! Mike and his brother Kris on the top of the tallest of the Three Sisters mountain! Races 3,4 and 5 had school races! Mike was up against Ironman Pros from other countrys. Awesome race! After 4 races Mike has been in the top 5 consistantly and has won the under-19 age group in each race! Mike was 4th (19:37) in the Intermediate Boys division. After rain fell all night the course was slick and very muddy as they made their way around the trails (5km) of the Nordic Olympic Training Center. The top 4 boys were all within 45 seconds of each other! 1st in age group, Provincial Champ! Gold- 1500m, 3000m, too young for WCSG! Bummer! Athletics Alberta held it's Annual Awards banquet at the Fantasyland Hotel in Edmonton, in November. MIke was awarded for his excellent season as he was among four finalist for the award! All of the nominees had awesome seasons and all were Alberta representatives at the Legion National Championships in New Brunswick last summer! 2005 "Triathlete of the Year"
Mike wins the Alberta Triathlon Associations "Youth Athlete of the Year" award in 2005 as he won every triathlon he raced that year. 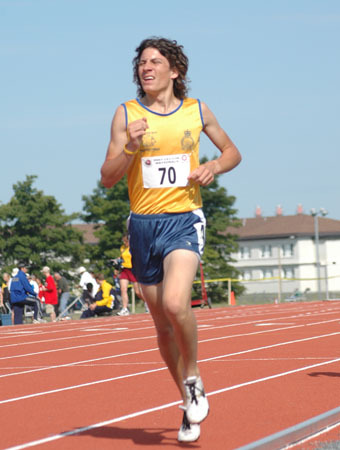 He was the Provincial Champion as well that year.